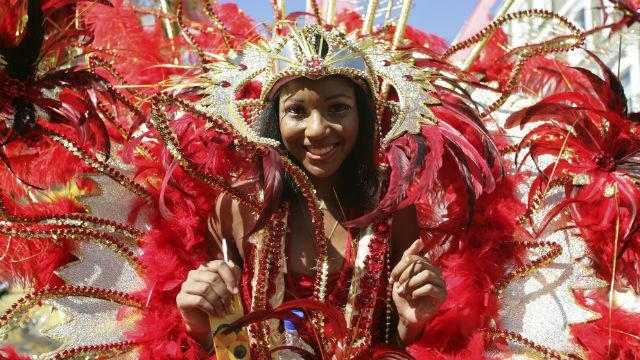 Notting Hill Carnival takes place every year on the last weekend of August and the summer bank holiday (public holiday) Monday. In 2017, the carnival is taking place on 26, 27 and 28 August. Check back closer to the time for the confirmed 2017 programme to see what time the festival starts and what’s on each day. The festival usually kicks off on the Saturday evening with Panorama, featuring music from steel bands and more outdoor entertainment for all the family. The traditional Caribbean carnival opening Jouvert takes place on Sunday morning, followed by the Family Day or Sunday Parade in the afternoon, with young performers dancing and swirling through the streets to show off their elaborate costumes. 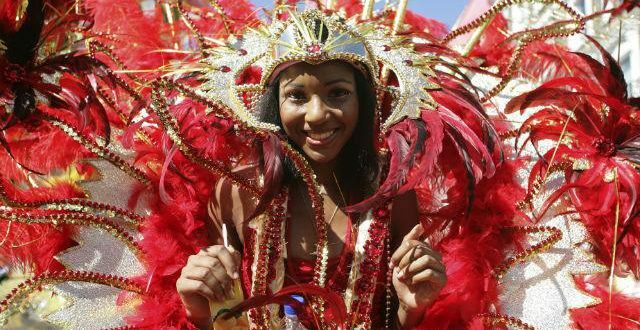 The Grand Finale fills the streets with steel bands, mobile sound systems, dancers and performers every year on the Monday. Delicious food and drinks are available from the many food stalls in the area on both Sunday and Monday, and there’s more music and stage shows to be enjoyed from the many static sound systems along the route and down side streets. Full details of the 2017 Notting Hill Carnival are yet to be announced, so check back nearer the time for the confirmed programme of events. With many road closures taking place during the festival, London public transport is the best way to travel to the Notting Hill Carnival. Allow extra time for your journey as a number of local Tube stations will be closed or subject to disruption. Extra buses will be put on during the carnival weekend, but buses will be diverted away from the carnival route. Check the Transport for London website before you travel for the latest Notting Hill Carnival transport information.